A visit to Hearst Castle seemed to be in order since Barbara Dow and I were already in Paso Robles overnight. We had driven south from Sacramento four hours to stay at The Oaks Hotel in Paso Robles and see The Monkees 50th Anniversary Tour. Now, I realize many people would not admit going to a Monkees’ concert because it seems so silly and not at all relevant to what’s happening around us in the world today, but we don’t care how it appears. That’s what makes the two of us great Sacramento Realtors, too. 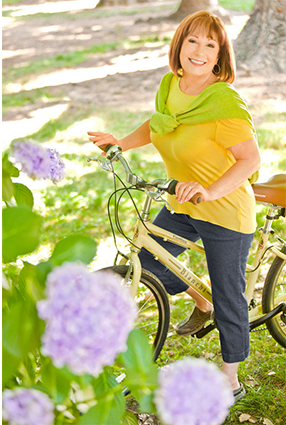 We write our own rules for happiness and help our clients achieve theirs as well. 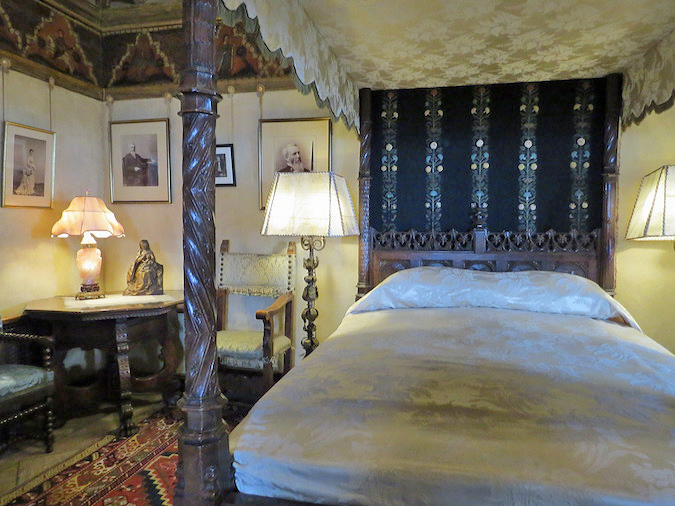 Clark Gable slept in many of the 38 bedrooms at Hearst Castle’s Casa Grande. 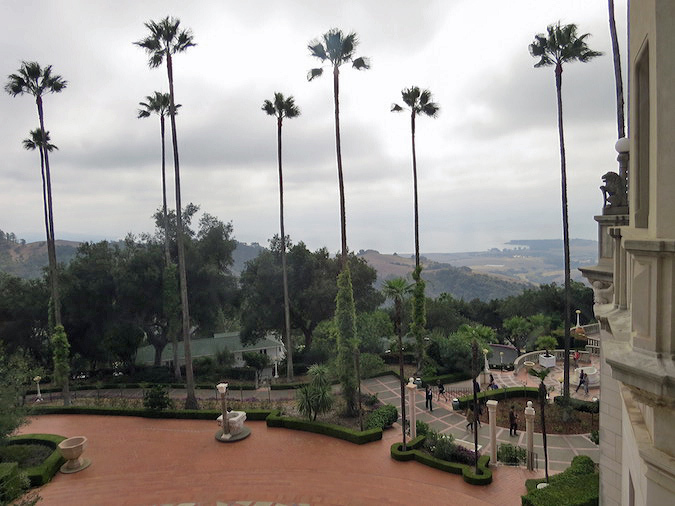 It’s a long story about when I was last at the Hearst Castle. I had visited San Simeon with my English professor in 1985, borrowing him from his wife with the compromise that I would return him one day if she ever desired him back and, eventually, she did. Which was OK, it was my idea. True story, maybe I’ll tell you sometime. Fact is you can’t see all of Hearst Castle in one day. I had visited the grand rooms back then, so it seemed appropriate now to do the Upstairs Suites Tour. The artwork alone is worth the Hearst Castle Upstairs Suites Tour. Much is a mishmash, culturally, historically and mixes styles and periods, among Italian, Spanish, French and other European influences. W.R. Hearst bought whatever whim fancied him and when he decided he no longer cared for something or it was a mistake, it was discarded and he’d start over. Apparently, while building an empire, much was disposable. Ceiling in the Doge’s Suite at Hearst Castle. The Doge’s suite at Heart Castle was fashioned after the Doges of Venice, those powerful leaders of Venice who resided at Doge Palace. Velvet drapes adorn the walls, but it was unclear as to whether the fabric was always there. I wondered about the condition of the walls behind the velvet. 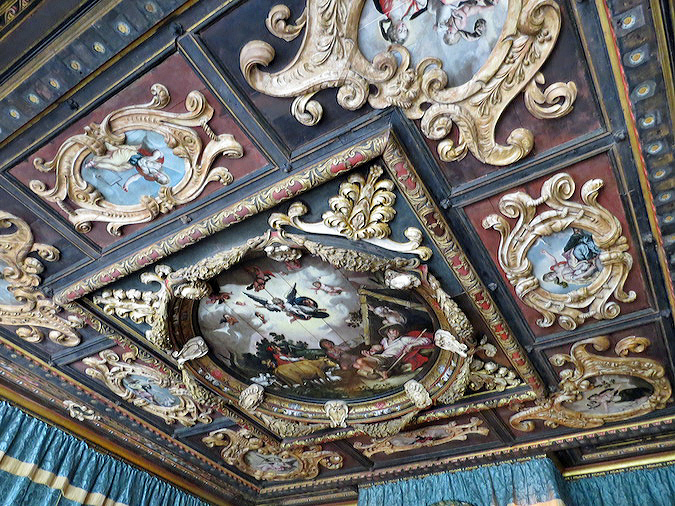 Renaissance art is abundant in this room, and the balcony ceiling was recently restored. There is also a huge stone fireplace. 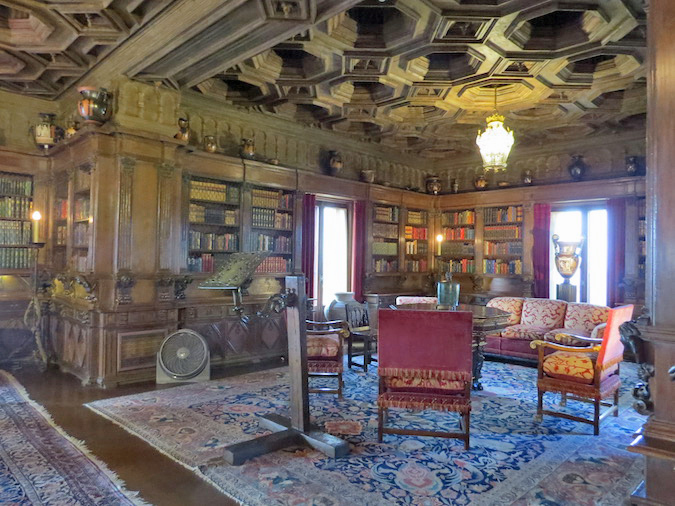 Bob Hope’s wife Dolores loved the library at Hearst Castle. Hearst Castle itself was designed by Julia Morgan, well known in Sacramento and San Francisco for her architecture. 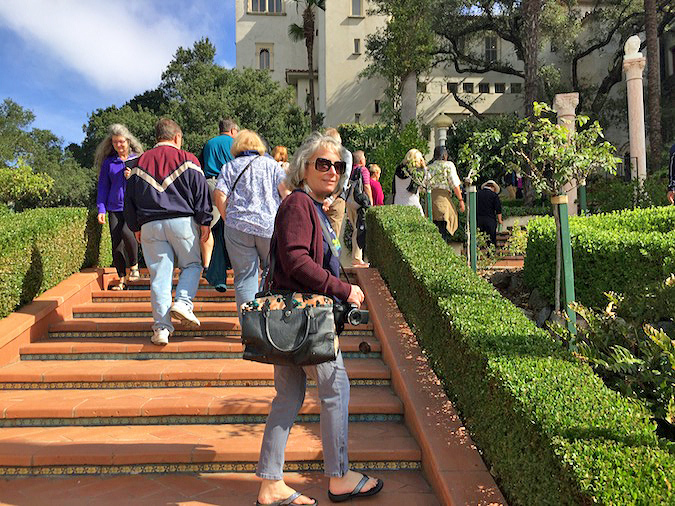 Our guide said when Julia Morgan came to visit the castle, she refused to ride a horse up the hill. Instead, they compromised and pulled up her car by a team of horses. We rode up the hill in a tour bus, and let me tell you, some of those drop offs on the switchbacks are steep and scary. Don’t look down! Instead, look up because the road was designed to make the castle vanish and reappear before your very eyes. This is one corner of the library, and I can see why Dolores Hope preferred to spend much of her time in this room. 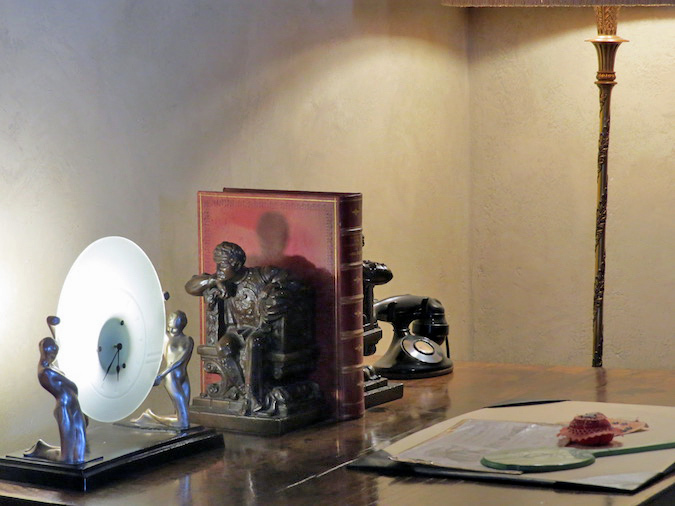 Marion Davies room reflects love of art deco at Hearst Castle. Showgirl and movie star, Marion Davies, was Mr. Heart’s “companion” for about 33 years, although Mr. Hearst never divorced his wife. When William Randolph Hearst died in 1951, he left 51% of his estate to Marion Davies, who then married 11 weeks later to someone else. Our guide said she also bailed out Mr. Hearst at one point by writing him a check for a million dollars. Apparently he owed more in obligations than he had liquid assets to pay. And you know what you call that. 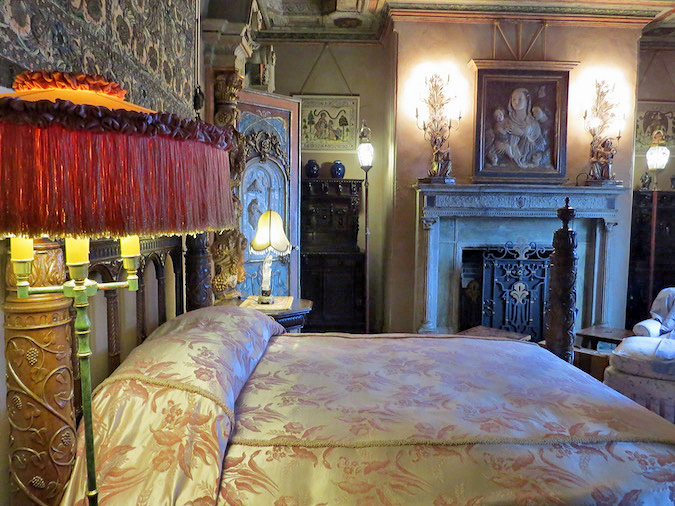 Private bedroom for William Randolph Hearst is small. This small bedroom seems lacking in space and amenities and design. Although lavish, it is very basic. The bed is small, perhaps closer to full-size than single. The photograph on the left is William Randolph Hearst. There is also a portrait on the right of his mother, Phoebe. That portrait was added by the State of California when this property became a museum and was not hanging there when Mr. Hearst occupied the room because that would be have been creepy. As if the Madonna and child stuff ubiquitous throughout was not creepy enough. Our guide, who was extremely personable, kind and resourceful, filled with historical facts that she shared, said Phoebe was worried about her son and, on more than one occasion, had expressed concern that he was addicted to buying art. When you have that much money and feel a need to spend, what else would you buy? Well, besides people. View from hallway by William Randolph Hearst private bedroom. Walking down the hallway, which is slanted a bit to let rain run off and is now enclosed by the State of California due to weather beatings, you can stop to capture and appreciate this wonderful view of the ground below, the road leading up to the hill, and all the way to the ocean. The Casa Grande sits about 1,600 feet above sea level. 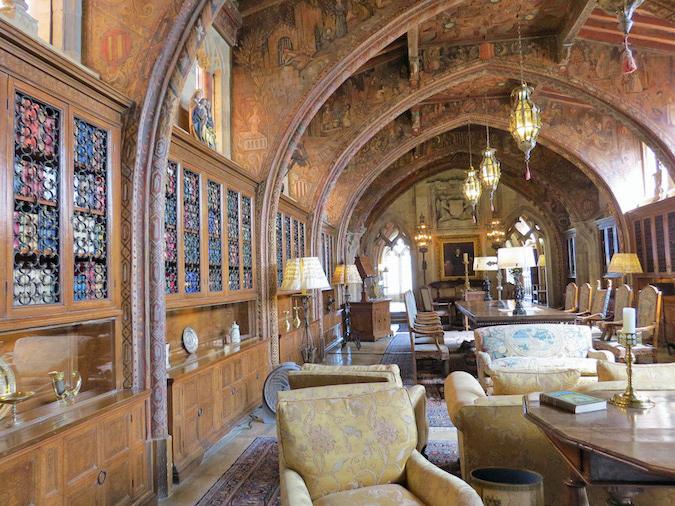 Office of William Randolph Hearst at Hearst Castle is like a Gothic church. What the private bedroom of Mr. Hearst lacks is made up for in his private office here, which shows you his priorities. There is no spot in this room unpainted or unadorned or not otherwise fussed with. The ribbed arches remind me of a Gothic cathedral from Spain, Italy or France. Beyond the oil painting that hangs on the far wall of William Randolph Hearst, is yet another private room designed for more intimate discussions. 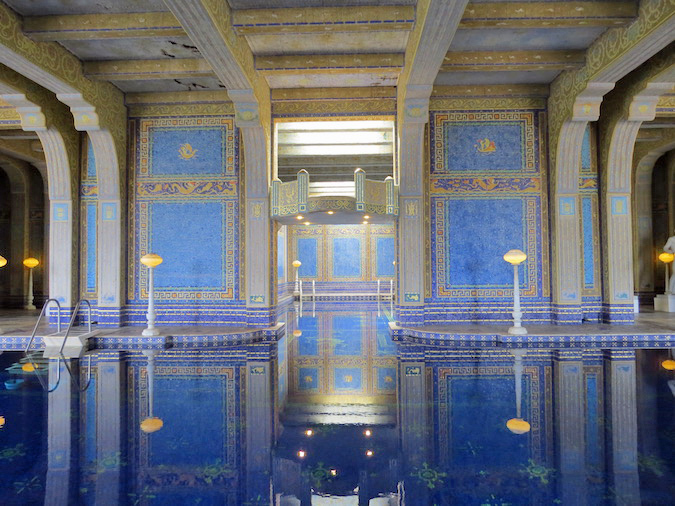 Roman pool features Murano glass tiles at Hearst Castle. The mosaic tile patterns in the Roman pool at Hearst Castle were inspired by the Mausoleum of Galla Placidia, a 5th century Byzantine structure in Ravenna, Italy. It’s very dark in this room, designed like a Roman bath. The depth of the pool is 10-feet at its deepest, and it holds 205,000 gallons of water, surrounded by 8 marble statues of Greek and Roman gods, among others, by Carlos Freter. The celestial room sits below the bell tower at Hearst Castle. Barbara and I stood in the Celestial room, situated just below the bell tower you see here, and could feel the breezes coming through the open windows from all directions. 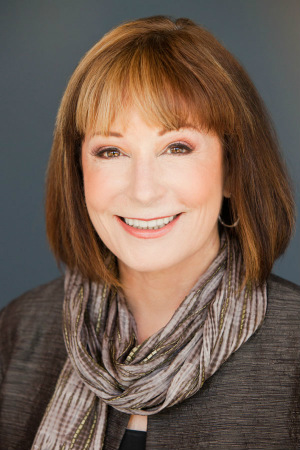 Being the Sacramento Realtors that we are, Barbara Dow asked all sorts of pertinent real estate questions such as is there air conditioning? No. No air conditioning. Not even today. 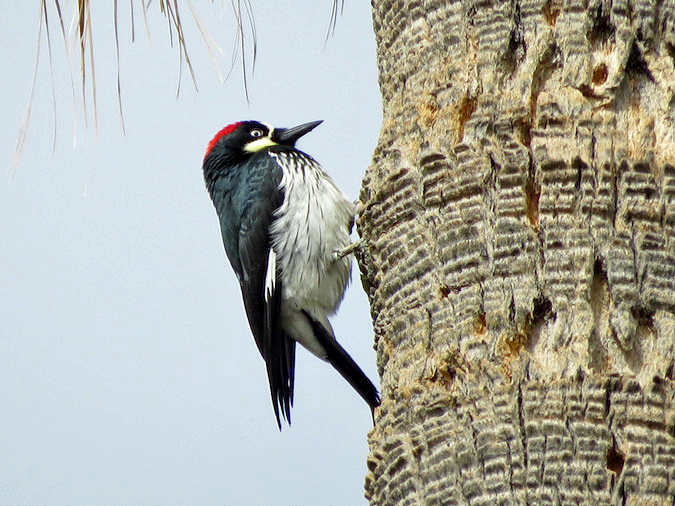 Acorn woodpecker clings to palm tree at Hearst Castle. Walking along the path that winds around the grounds of La Questa Encantada (the enchanted hill) we first heard the unusual sounds emitting from a chattering bird, and then we spotted it flying. What is that? I cried out. Looking up, I spotted the bird land on a palm tree and whipped out my Canon Powershot to capture it. Sure enough, it is an acorn woodpecker, and this is one of the best photos I’ve ever shot of this particular bird. 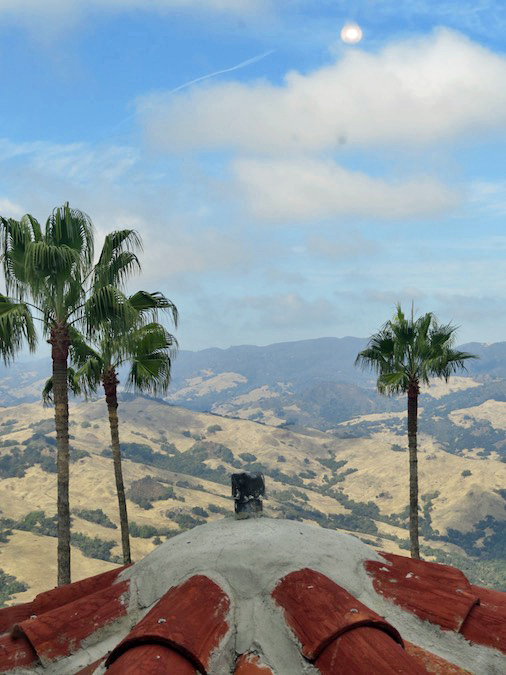 East roof-top view from Marion Davies’ room at Hearst Castle. Another question asked by Barbara Dow was old is the roof? You know, you can’t help yourself. I caught her eye and we giggled. Turns out, the roof was recently replaced. When you look at the mortar spread all over the tile peak pictured here in the view from Marion Davies’ room, you’ve got to wonder why, after all of these years, they haven’t developed a better way to seal tile roofs? Really, is this the best our building crews can do today? This photo, like much of the landscaping surrounding Casa Grande, looks more like a painting than a photo, don’t you think? 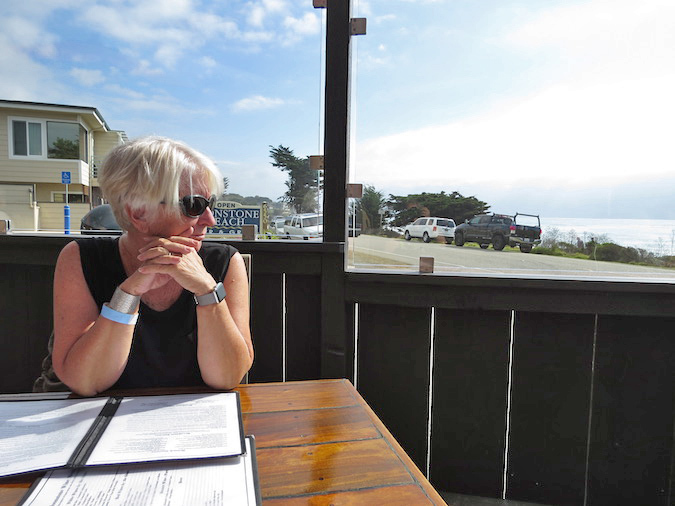 Barbara Dow at Moonstone Beach and Grill, Cambria. Our guide at the Hearst Castle Upstairs Suites Tour was so informative and interesting, Barbara and I could have sat in the Celestial room for a week and listened to her. The guide had a wonderful sense of humor and so much knowledge to share we couldn’t get enough. What was supposed to be a one-hour tour turned into almost 3 hours, and it wasn’t us doing all of the talking. She mesmerized our entire small tour group! However, we were starving by the end of the Upstairs Suites Tour. Our tour started at noon, and by 3:00, we had driven 7 minutes toward Cambria, exiting to have lunch at the Moonstone Beach and Grill. To the left of that black pickup truck we spotted a whale, continuously resurfacing to inhale and release air. I think it’s too early for gray whales; it might have been a humpback, especially since the spray of water resembled a column. From there, it was a 5-hour drive back to Sacramento. No traffic on Interstate 5. Not even for a Sunday night. We just lucked out. I would be willing to return for another visit, but maybe make our last day in the area somewhere a bit closer to Sacramento. 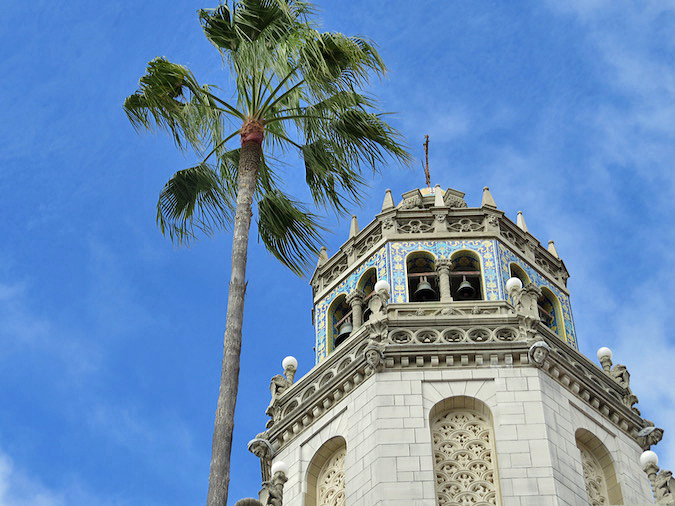 You can buy tickets online up to 56 days in advance for the Hearst Castle Tours here.